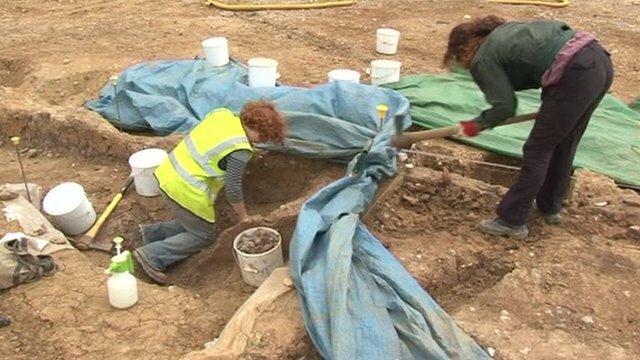 Archaeologists from the University of Manchester and the Herefordshire Council have unearthed the remains of two large halls that were constructed more than 6,000 years ago. The burned and buried halls, which were discovered atop Dorstone Hill, near Peterchurch in Herefordshire, are believed to have been constructed between 4000 and 3600 BC. Some of the charred wood at the site shows the character of the structure of the buildings as they may have looked above ground. The researchers suggest these buildings were used by entire communities, but do not have enough information to determine how large each structure was. However, based on the length of theNeolithic-era barrows beneath each of the buildings, the researchers estimate the halls to have been 100 and 230 feet long, respectively. The team also believes the buildings were deliberately burned down after construction and the remains of the buildings were incorporated into two unique burial mounds on the hilltop. Even though the halls were burned, much detail is still preserved in the larger barrow. The team has found carbonized structural timbers, postholes that offer positions of original uprights and the burnt remains of stakes of the internal partitions. Also, the burial mounds are composed of burnt clay, which implies the daub from the walls of the buildings was used in the burial process. The remains of two large 6000-year-old halls, each buried within a prehistoric burial mound, have been discovered by archaeologists from The University of Manchester and Herefordshire Council -- in a UK first. The sensational finds on Dorstone Hill, near Peterchurch in Herefordshire, were thought to be constructed between 4000 and 3600 BC. Some of the burnt wood discovered at the site shows the character of the building's structure above ground level -- in another UK first. The buildings, probably used by entire communities, are of unknown size, but may have been of similar length to the Neolithic long barrows beneath which they were found – 70metres and 30m long. They were, say the team, deliberately burnt down after they were constructed and their remains incorporated into the two burial mounds. However -- much detail has been preserved in the larger barrow: structural timbers in carbonized form, postholes showing the positions of uprights, and the burnt remains of stakes forming internal partitions.. The discovery of an “early modern human” dating from 40,000 years ago in a cave outside Beijing, and a comparison of the individual’s DNA with that of populations around the globe, are providing new pieces in the puzzle of how Homo sapiens left their African origins to expand across the continents. DNA extracted from the Tianyuan Cave dweller indicated he was genetically related to today’s Amerindians, said FU Qiaomei, Institute of Vertebrate Paleontology and Paleoanthropology (IVPP), Chinese Academy of Sciences in Beijing, one of the scientists who led the study at Germany’s Max Planck Institute for Evolutionary Anthropology. This Tianyuan fisher-gatherer is one of the earliest H. sapiens ever uncovered in China, she said in an interview. “Our reconstruction of this Mesolithic house is part of the UCD Centre for Experimental Archaeology,” says Dr Graeme Warren, UCD School of Archaeology. 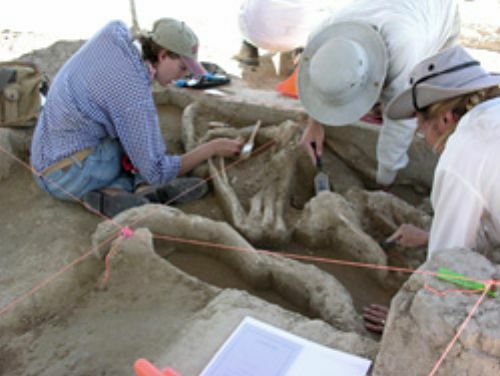 Researchers at the University of Kansas have been digging for clues that would tie the remains of a 15,500-year-old mammoth discovered in west-central Kansas with prehistoric human artifacts found nearby. A site which experts believe could be an Iron Age settlement is being excavated on land where the new Turing College at the University of Kent will be built. An open day on Thursday allowed the public to see items such as a gold coin, a bronze bell and some of 2,500-year-old pottery uncovered so far by the team of 40. 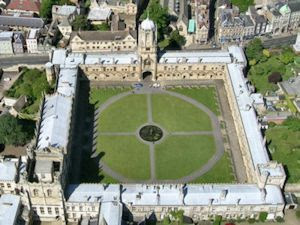 The new college is being named after World War II codebreaker Alan Turing, who grew up in Guildford, Surrey. Archaeologists have unearthed relics that suggest prehistoric humans lived along the Silk Road long before it was created about 2,000 years ago as a pivotal Eurasian trade network. An excavation project that started in 2010 on ruins in northwest China's Gansu Province has yielded evidence that people who lived on the west bank of the Heihe River 4,100 to 3,600 years ago were able to grow crops and smelt copper, the researchers said. The site is believed to date back to the Han Dynasty (202 BC - AD 220). Over the past three years, archaeologists have discovered a variety of copper items, as well as equipment used to smelt metal, said Chen Guoke, a researcher with the Gansu Provincial Institute of Archaeology. "People back then mainly dealt with red metal. They also began to make alloys," said Chen, who is in charge of the excavation project. Artists and craftsmen more than 2,000 years ago developed thin-film coating technology unrivaled even by today's standards for producing DVDs, solar cells, electronic devices and other products. 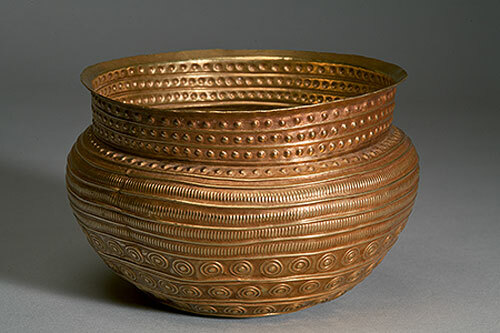 Understanding these sophisticated metal-plating techniques from ancient times, described in the ACS journal Accounts of Chemical Research, could help preserve priceless artistic and other treasures from the past. Season 2013 of the excavations taking place at the site of Kadmeia in Boeotian Thebes in central Greece has been completed bringing to light a series of impressive finds, including Mycenaean frescoes and a Late Antique mosaic, according to a local newspaper’s report. As stated by “Boiotiki Ora” newspaper, one of the most impressive finds is the mosaic floor depicting marine landscape, which came to light in Antigonis Street. 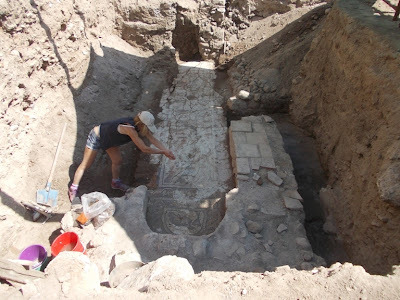 According to the Emeritus Head of the Ephorate and head of the excavation team dr Vassilis Aravantinos, the mosaic dates to the 4th century AD, sharing the same dating with similar mosaics located during the past in Pindarou Street and the Stamatis Plot. Two meters further and to the left of the mosaic, the excavators hit the destruction layer of the Mycenaean palace. 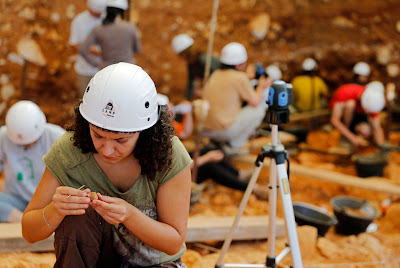 From under strata spanning hundreds of millenia at this site in northern Spain, they unearth ancient mouse bones and the teeth of horses -- but what they most hope for is a sign of prehistoric humans that could write a new chapter in our evolution. Most child health experts agree that a minimum of six months of breastfeeding is essential for the welfare of growing babies, although how well such recommendations are carried out widely varies across the globe. Less is known about the breastfeeding habits of other primates — and much less still about those of prehistoric humans. A research team now reports a new technique for accurately detecting when babies were weaned, using chemical signatures in their teeth. The method was successfully applied to the tooth of a Neanderthal child, raising the possibility that researchers could decipher the life histories of our evolutionary cousins and even gain insights into why they went extinct. Fossils of prehistoric humans and other primates are relatively rare because bone does not last well in most environments. Teeth, on the other hand, are hard and strong enough to survive through the ages, and they are often found at palaeontological and archaeological sites. Researchers have worked diligently to extract information from ancient teeth. Palaeontologists recently reported finding the teeth of the earliest apes, and archaeologists have used chemical isotopes in the teeth of early farmers to track their movements across the landscape. WHEN Neanderthal bones were discovered in the 19th century, their robust build and heavy brows led palaeontologists to characterise them as brutish, and their name is still pejorative today. Since then, we have found ample circumstantial evidence to suggest this stereotype is far from fair. Tools, jewellery and even cosmetics discovered among Neanderthal bones suggest that they were uncannily like us – a view strengthened when their genome was sequenced, showing a remarkable genetic overlap. 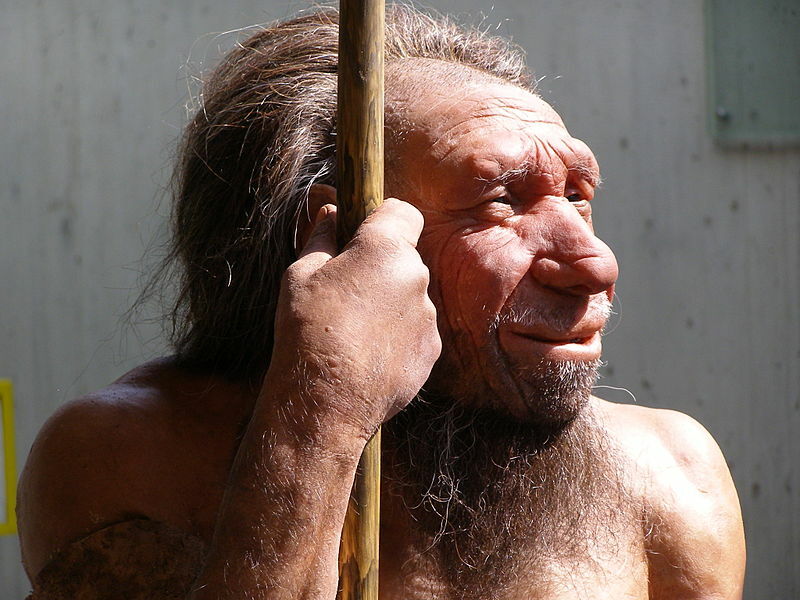 Now the Neanderthal epigenome – the system of on/off switches that modify gene activity – has been deciphered (see "First look into workings of the Neanderthal brain"), allowing us to directly assess the mental life of our extinct cousins for the first time. 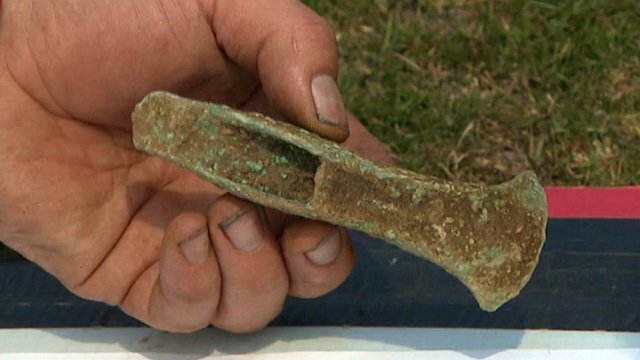 Bronze Age pottery and a "very rare" axe have been found at the site of a future tungsten mine near Plymouth. Wolf Minerals, the firm behind the development of Hemerdon mine, has provided £1m towards the four year archaeological project as part of the planning agreement. The dig will end later this year, with the company hoping to begin mining by the end of 2014. Bronze Age settlements and Neolithic pottery are some of the finds made by UCL archaeologists during the construction of major new sea defences inland at Medmerry between Selsey and Bracklesham in West Sussex. Once the fieldwork is complete, the archive of artefacts will be submitted to Chichester Museum. Sussex has some of the earliest British Neolithic monuments, but recent discoveries have now doubled the number of known features of this date from non-monumental sites on the Sussex coast, heralding an important development in understanding the nature of the Sussex in the Neolithic era. Other finds include three large and two small circular Bronze-age houses, water management features, and a cremation cemetery. It would appear that a large area of Bronze Age landscape has been preserved at Medmerry under sediments and other deposits and the site has the potential to preserve wooden structures, such as a section of wattle work recorded at the base of a Bronze Age well, which has been carbon dated to c. 1,100 BC. Other features were dated by finds of Bronze Age pottery. Researchers from the University of Tübingen have successfully re-attached the newly discovered head of a prehistoric mammoth-ivory figurine discovered in 1931. The head was found during renewed excavations at Vogelherd Cave, site of the original dig in 1931. The recent excavations, between 2005 and 2012, have yielded a number of important finds. The discovery of this ivory head helps to complete a figurine which now can be recognized as a lion -- and demonstrates that it is possible to reassemble often fragmentary figurines from the earlier excavation. The new discovery is presented in the 2013 edition of the journalArchäologische Ausgrabungen in Baden-Württemberg. When did people first begin to express their feelings with flowers? It turns out that in prehistoric times, Mount Carmel residents in what today is northern Israel buried their dead on a literal bed of fragrant wild flowers, such as Judean sage, as well as blooming plants of the mint and figwort families. Assuming they had the same positive associations with flowers that we do today, these ancient humans must have sought to ensure for the deceased a pleasant passage from the world of the living. The discovery is the oldest known use of flowers in grave lining. According to radiocarbon dating performed by Dr. Elisabetta Boaretto at the Weizmann Institute of Science, the graves are 11,700 to 13,700 years old. 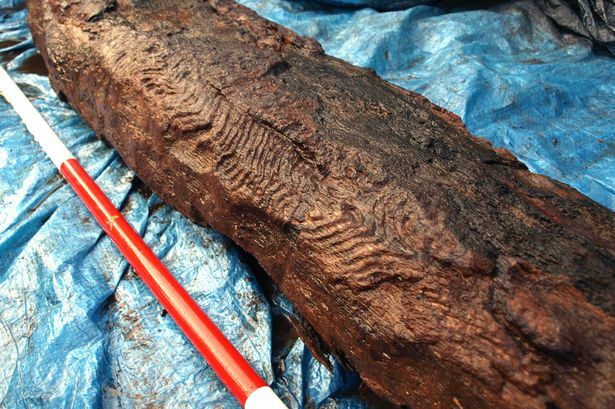 Archaeologists have unearthed what is believed to be one of Europe's oldest decorative wood carvings - dating back more than 6,000 - on a Valleys hillside. The decorative carving was exposed by workmen during the construction of Maerdy Wind Farm in the Rhondda Valley. Richard Scott Jones, an archaeologist from Heritage Recording Services Wales, said the piece of wood was “priceless” and would be unveiled to the public at the National History Museum in St Fagans next year. 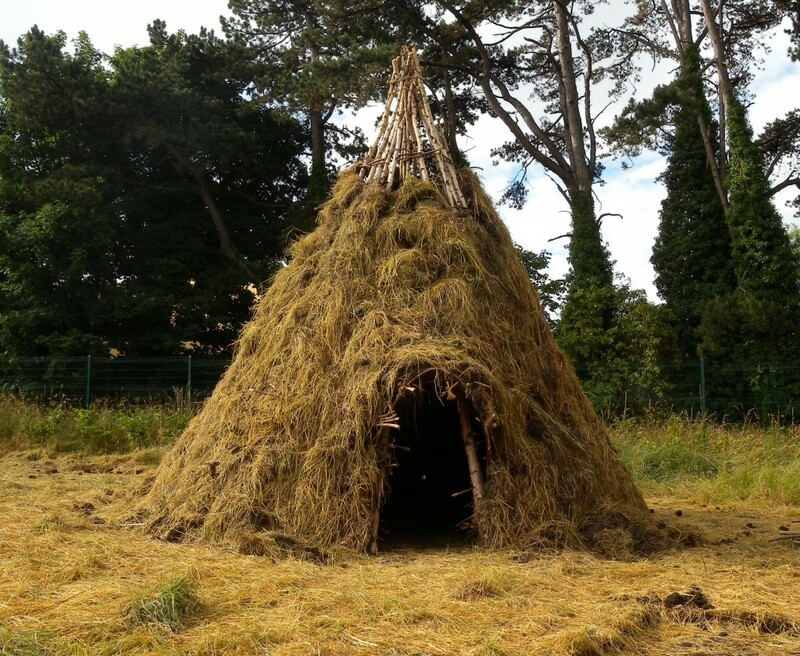 He said the wood is likely to date back 6,270 years to the Late Mesolithic/Early Neolithic period. “In archaeological circles, this is the is equivalent to winning the lottery,” he said. Primitive society was not driven by war, scientists believe. Researchers from Abo Academy University in Finland say that violence in early human communities was driven by personal conflicts rather than large-scale battles. 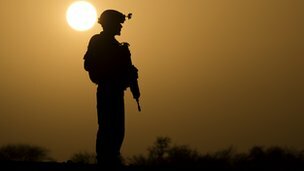 They say their findings suggest that war is not an innate part of human nature, but rather a behaviour that we have adopted more recently. Patrik Soderberg, an author of the study, said: "This research questions the idea that war was ever-present in our ancestral past. It paints another picture where the quarrels and aggression were primarily about interpersonal motives instead of groups fighting against each other." Ever since the discovery of the remains in 2003, scientists have been debating whether Homo floresiensis represents a distinct Homo species, possibly originating from a dwarfed island Homo erectus population, or a pathological modern human. The small size of its brain has been argued to result from a number of diseases, most importantly from the condition known as microcephaly. Based on the analysis of 3-D landmark data from skull surfaces, scientists from Stony Brook University New York, the Senckenberg Center for Human Evolution and Palaeoenvironment, Eberhard-Karls Universität Tübingen, and the University of Minnesota provide compelling support for the hypothesis that Homo floresiensis was a distinct Homo species. 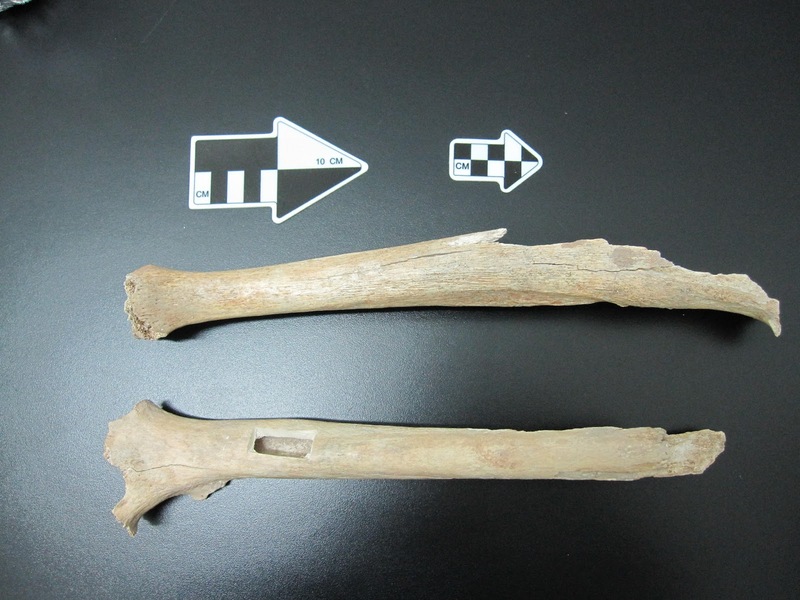 The study, titled "Homo floresiensiscontextualized: a geometric morphometric comparative analysis of fossil and pathological human samples," is published in the July 10 edition of PLOS ONE. Help float the Dover Bronze Age boat! Canterbury Archaeological Trust (CAT) is using the crowd-funding site Kickstarter to raise funds towards a replica of the Dover Bronze Age boat. The replica sewn-plank boat has already been built using oak timbers, bronze tools and authentic techniques but more funding is needed to take it to sea for the first time. Although half-scale, the boat measures 8m long and weighs about a ton. Having acted as the centrepiece of a major exhibition which has toured France and Belgium, the replica boat now needs to be stripped down and re-stitched ahead of taking it to sea. A new study says Europe's first farmers used far more sophisticated practices than was previously thought. A research team led by the University of Oxford has found that Neolithic farmers manured and watered their crops as early as 6,000 BC. It had always been assumed that manure wasn't used as a fertiliser until Iron Age and Roman times. 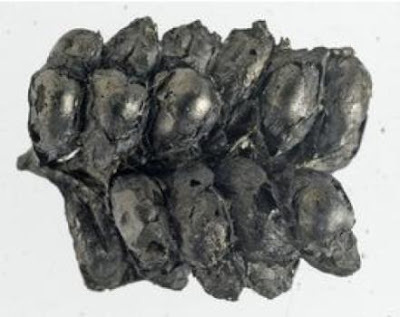 However, this new research shows that enriched levels of nitrogen-15, a stable isotope abundant in manure, have been found in the charred cereal grains and pulse seeds taken from 13 Neolithic sites around Europe. The findings are published in the early edition of the journal Proceedings of the National Academy of Sciences. The study suggests that Neolithic farmers used the dung from their herds of cattle, sheep, goats and pigs as a slow release fertiliser for crops. Archaeologists believe they have discovered the world's oldest lunar "calendar" in an Aberdeenshire field. The Mesolithic "calendar" is thousands of years older than previous known formal time-measuring monuments created in Mesopotamia. Humans had a sophisticated calendrical system thousands of years earlier than previously thought, according to new research. The discovery is based on a detailed analysis of data from an archaeological site at Crathes Castle (Aberdeenshire, Scotland) - a row of ancient pits which archaeologists believe is the world's oldest calendar. The pit alignment, at Warren Field, was first excavated in 2004 - now a team led by the University of Birmingham suggests the ancient monument was created by hunter-gatherers about 10,000 years ago. Archaeologists believe that the complex of pits was designed to represent the months of the year and the lunar phases of the month. They believe it also allowed the observation of the mid-winter sunrise so that the lunar calendar could be annually re-calibrated to bring it back into line with the solar year. Remarkably the monument was in use for some 4,000 years and the pits were periodically re-cut over those four millennia. It is therefore impossible to know whether or not they originally held timber posts or standing stones after they were first dug 10,000 years ago. However variations in the depths of the pits suggest that the arc had a complex design - with each lunar month potentially divided into three roughly ten day 'weeks' - representing the waxing moon, the gibbous/full moon and the waning moon. The 50 metre long row of 12 main pits was arranged as an arc facing a v-shaped dip in the horizon out of which the sun rose on mid-winter's day. There are 12.37 lunar cycles (lunar months) in a solar year - and the archaeologists believe that each pit represented a particular month, with the entire arc representing a year. 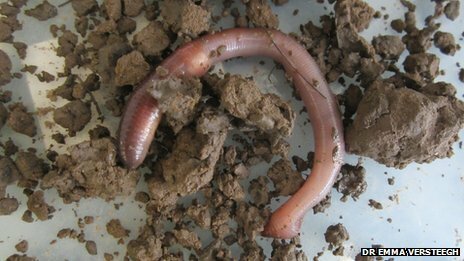 The worm secretions may act as a "self-produced indigestion tablet"
Earthworm faeces can be used to measure past temperatures, providing a window into the ancient climate. A study shows that the chemistry of small balls of chalky crystals secreted into soil by the worms varies with temperature. A UK team said the granules could be compared with other climatic "proxies", such as ice cores and deep sea sediments. Details appear in the journal Geochimica et Cosmochimica Acta. Scientists from the universities of Reading and York report that the calcium carbonate (calcite) nodules dug up from archaeological sites give a unique measure of the ancient local temperatures. Because the ratios of different isotopes, or forms, of oxygen within the calcite crystals vary with temperature, they record the conditions present as they grow inside the worms. Archaeologists are drafting a volunteer army to help map every ancient hill fort across Britain and Ireland. It is part of a project to create an online atlas of around 5,000 of theseIron Age monuments. Prehistory enthusiasts are being asked to identify and record features such as ramparts, ditches and entrances. Prof Gary Lock, of Oxford University, said: "We want to shed new light on why they were created and how they were used." 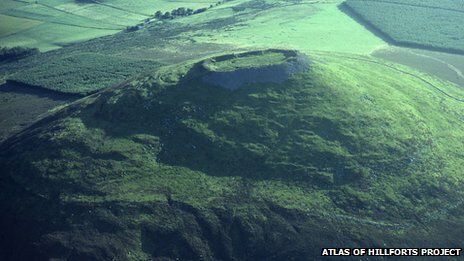 Despite their large numbers there has been little academic work on hill forts, how they were used and how they varied across Britain and Ireland, the researchers say. Chersonesus , an ancient Greek colony founded approximately 2,500 years ago in the southwestern part of the Crimean Peninsula, known then as Taurica, was established in the 6th Century BC by settlers from Heraclea Pontica. “We’ve learned things that have changed our view of what life was like in the Chersonesean countryside, which the Greeks called chora. The city’s rural territory, particularly on the Herakleian and Tarkhankut peninsulas, is incredibly well preserved. The houses of the rural population dating back to about 300 BC lie dotted around the untouched landscape in the form of ruins that are still visible. For instance, in one of the excavated ruins we have found the remains of a whole family. So we’re working on a murder scene dating back 2,300 years,” reports project director Vladimir Stolba, an archaeologist from Aarhus University. 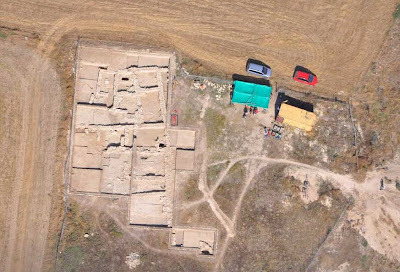 The 2013 field season at the Late Bronze Age harbour city of Hala Sultan Tekke, near Larnaka International Airport, has been completed.. The excavations, which took place for over five weeks during May and June, were conducted under the direction of Professor Peter M. Fischer from the University of Gothenburg, Sweden. The excavations exposed hitherto unknown city quarters dating to the 14th – 12th centuries BC. The size of this city is estimated between 25 and 50 ha. Only a small portion of the city, the history of which goes back to the 16th century BC, has so far been excavated. At the beginning of the 12th century BC the city was destroyed and abandoned, and never inhabited again. The discovery of a city quarter was made possible through the use of a sophisticated ground penetrating radar device in 2010 and 2012, as part of a cooperative project between the University of Gothenburg (Prof. Peter M. Fischer) and the University of Vienna (Dr Immo Trinks). A ground penetrating radar may produce “X-ray images” of the soil up to 2m beneath the surface. The 2013 excavations, which exposed 200 square metres of the city, confirmed the interpretation of the radar survey. Neanderthals used to have homes to which they returned after going on hunting expeditions, Oxford University and Gibraltar Museum researchers claim. Granted, their homes would've probably never made it on MTV's “Cribs,” but they were surprisingly clean and tidy, the scientists argue. While exploring ancient caves in Gibraltar, archaeologists reportedly found that some of them contained more artifacts than others did. The best explanation for this discovery is that the Neanderthals preferred certain caves to others. These “privileged” caves are the ones believed to have been their homes. They were both bigger and brighter than the ones Neanderthals only inhabited for short periods of time. Regierungspräsident Johannes Schmalzl präsentierte gemeinsam mit dem Abteilungspräsidenten des im Stuttgarter Regierungspräsidium angesiedelten Landesamtes für Denkmalpflege Prof. Claus Wolf die Restaurierungsarbeiten an einem der ältesten Kunstwerke der Menschheit. Following on from the fantastic success of the Operation Nightingale excavation at Barrow Clump last summer, the soldiers have returned for a second year. The 2013 excavations will explore new areas of this Bronze Age burial mound and aim to identify the extent of the Saxon cemetery. A year passes very quickly and we started again at Barrow Clump last week, this time for five weeks until the end of July. Site camp was established, nettles cleared and trees trimmed, whilst the badgers appear to have temporarily vacated the site. Dr. Helise Coopersmith (left), North Shore-LIJ musculoskeletal radiologist, joins Anagnostis Agelarakis, professor and chair of anthropology at Adelphi University, and Argie Agelarakis, a scientific illustrator, as they examine a 2,500-year-old bone fragment. CREDIT: North Shore-LIJ Health System. Dr. Helise Coopersmith is a musculoskeletal and body imaging radiologist for the North Shore-LIJ Health System, assistant professor of radiology at the Hofstra North Shore-LIJ School of Medicine and a member of the Hofstra medical school's admissions committee. She contributed this article to LiveScience's Expert Voices: Op-Ed & Insights. The DGUF has today handed over its petition against the cuts and the planned axing of the Federal State funding for archaeology and the preservation of ancient buildings and monuments in North-Rhine Westphalia (NRW) to Carina Gödecke (SPD), President of the NRW Parliament, and Michael Groschek (SPD), Minister for Building, Housing, City Development and Transport. More than 27,000 people signed the petition, including over 13,000 from NRW. This petition is thus the largest collection of signatures ever against cuts in the budget for the preservation of historic monuments in Germany. "The message has hit home," said Carina Gödecke. It would receive serious consideration in the 2014 budget deliberations in the autumn. The DGUF petition demands that the Federal State funding for archaeology and the preservation of buildings and monuments be neither axed nor cut. The NGO demands that, in the long term, the funding provided by the Federal State of NRW itself to support archaeology and the preservation of buildings and monuments be kept at the level of the 2012 fiscal year at least. In this year 11.3 million euros were available (lines 883 60 and 893 60 in the NRW Federal State budget of the Ministry for Building, Housing, City Development and Transport). The funding for 2013 has already been cut by 2 million euros. The exhibition Bronze Age. Europe without borders. Fourth-first millenia BC opened last Friday on June 21st. The exhibition is one of the most important museum and research projects of Russia and Germany in 2009-2013 and it closes the Year of Germany in Russia. However, the event of the grand opening has been overshadowed by a diplomatic row between Germany and Russia, with Moscow objecting to Angela Merkel’s plan to use her speech to refer to hundreds of German works of art looted by Red Army soldiers after the war. One of the highlights of the exhibition is the Eberswalde Hoard, which consists of 81 ancient gold pieces including plates, rings and ornate bowls that has not been seen in public since the end of the war. The hoard, discovered during an excavation of north-east of Berlin in 1913, was removed from a museum in the German capital by Soviet troops and transported to Moscow as war booty. According to George Streiter, the German government spokesman, the German chancellor had planned to use her speech to call for the return of the art in accordance with international law. Mr Streiter said Russia had cancelled the opening speeches, blaming time constraints, which prompted outrage in the German media. 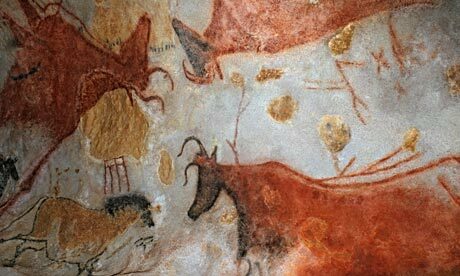 Off the wall: a close-up view of cave art in the Vallee de la Vezere. At some point in remote prehistory, roughly 12,000 years ago, a group of men and women – no more than half a dozen, scientists believe – crawled into the labyrinth of Rouffignac cavern in the Dordogne's Vézère valley. Once in its deepest recess, they lay on their backs and, in flickering candlelight, started painting on the rock ceiling 3ft above them. More than 60 images of mammoths, horses and ibex were outlined, each animal depicted in simple, confident lines that reveal startling artistic talent. This is the Great Ceiling of Rouffignac, one of the world's oldest and most beautiful art galleries. 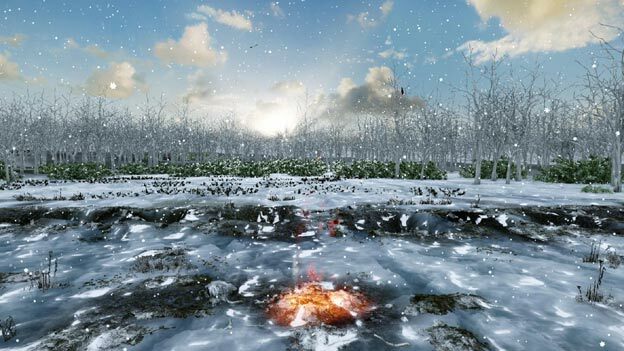 We have few clues as to who created it, though it was probably the work of the Cro-Magnons, the first members of Homo sapiens to settle in Europe 45,000 years ago and survivors of the Ice Age that later gripped the continent. Nor do we know why these artists picked such an inaccessible spot to display their genius – though fortunately it can be reached easily today. A tiny electric train runs from Rouffignac's entrance to the Great Ceiling, the floor of which has been lowered to allow visitors to gaze up at its wonders.